My struggle with exercise is well-documented. It’s hard for me to stay motivated to exercise for the sake of exercise. I like being active, and engaging in activities like hiking, biking, and swimming. But sometimes that’s not feasible. In fact, I’ve spent a lot of time making exercise a priority and just forcing myself to go to the fitness room in my apartment community. However, even though I know exercise is important, I still have a hard time, especially when I exercise and exercise and don’t see the results I’d like to see. 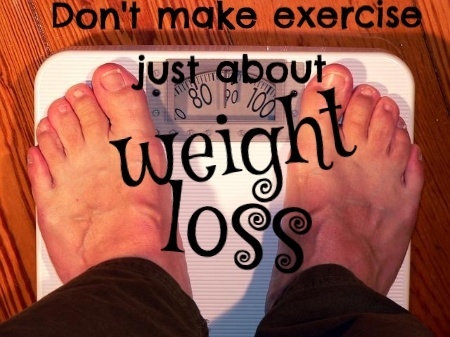 Think about it: Many of us exercise and try to eat right in order to experience weight loss. The fact that I’ve weighed more every time I’ve stepped on a scale in the last week and a half has me wondering why I’m putting myself through all this difficulty. Build lean muscle: One of the best reasons to exercise is to build lean muscle. I’d like to think that one of the reasons I’ve been gaining weight in spite of my best efforts is due to building muscle (even though my arms refuse to de-flab, no matter how many pushups I do). I don’t know if that’s true, but the reality is that it’s a good idea to build lean muscle. Boost your energy: Even though I’ve been frustrated about my flabby arms and the refusal of the scale to show smaller numbers, I’ve felt more energetic. Exercise can boost your energy, and I’ve noticed an increase in my energy level as a result of regular exercise. Sleep better at night: Sleep is an important part of your health and wellness. Physical activity during the day can tire you out so that you sleep better at night. Better sleep means an increased ability to focus, improved productivity, and better overall physical and mental health. Improve your mood: Exercise can also help you improve your mood. Your brain releases endorphins when you exercise, and you can also benefit from a physical release of pent up energy and emotions. You’re better able to cope with difficulties when you take the time for regular exercise. Depending on the exercise you do, you can also improve various aspects of the way your body functions. There are exercises that can help you improve flexibility, encourage better posture, and strengthen bones and muscles. All of this can be useful as you age. In fact, if you exercise now, you will be more likely to have a better quality of life later. If you want to increase the chances that medical costs won’t ruin your retirement, exercise now can be a big part of the equation. After thinking about all of the health benefits of exercise, it occurred to me that focusing on weight loss is probably not the best plan. While weight can provide a useful benchmark for progress, it isn’t everything. Instead of obsessing about my weight, I’m going to try to focus on all the positive things exercise is bringing into my life. It’s kind of hard to do when I am engaged in the chore of using the elliptical machine, but it’s something I need to do if I’m going to stick with it long enough for it to be a long-term positive gain for my health.